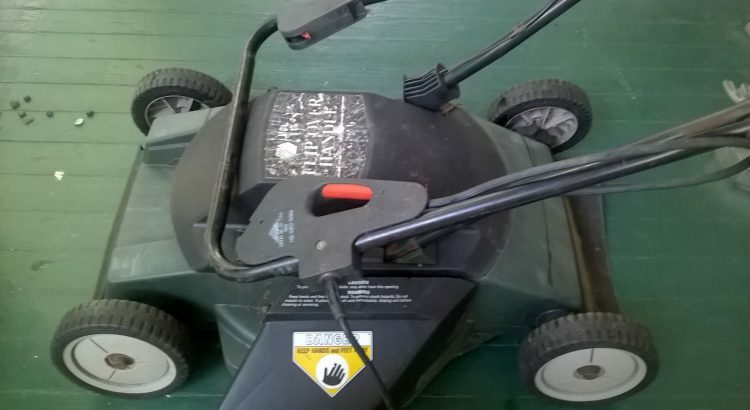 I saved a corded electric lawn mower from the landfill last week. It is an older mostly plastic model. The electric motor had frozen up so I removed the blade, squirted in household lubricating oil, worked it back and forth and finally got it freed up. I knew when I saved it that it was not much of a find. It has more value in explaining how and why to recycle an object like this. 1. Use as is with a cord. 2. Make portable using a inverter and battery. This will provide the A/C power required. Remember to calculate the watts required by multiplying the Amps times the Volts. This one uses 4.5 (a rather small amount). 4.5 X 120 = 540 watts. Make sure your inverter supplies at least this much wattage. An inverter is a good thing to have anyway for emergency and off the grid needs. 3. Convert to a truly non corded model by replacing the A/C electric motor with a D/C motor and using batterie(s) to power it. Not sure if this model is worth it. The weakest part that I observed are the plastic wheel mounts. I would recommend using an old steel chassis from a former gasoline powered lawn mower instead. 4. Salvage parts such as the motor and wheels and recycle the rest. All of these options are preferable to sending the entire thing to the landfill.